Leaving rehab is an exciting time. You’re beginning a new chapter in your life, equipped with the tools to maintain your sobriety. However, this does not mean that you won’t be faced with temptation. 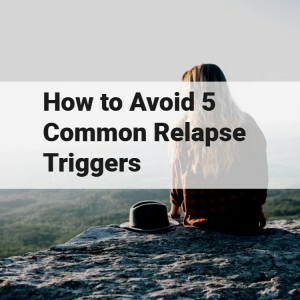 The best way to prevent relapse after rehab is to proactively think about what triggers the urge to use and how you’ll handle cravings when they arise. Everyone’s experience is a little different, but this post outlines the most common triggers and offers suggestions you can use to help yourself stay clean. A major part of the appeal of drugs and alcohol is that they provide a temporary escape from life’s stressful situations. If you’re worried about losing your job, experiencing financial difficulties, or fighting with your significant other, the key to maintaining your sobriety will be finding a constructive outlet for your stress. Talk to a friend about what’s bothering you and brainstorm solutions together. Boredom is a common trigger among recovering substance abusers who turned to drugs and alcohol as their preliminary method of socializing and having fun. It can be challenging to find ways to entertain yourself after leaving the structured environment of a rehab facility. Have friends over to binge watch a new show on Netflix while enjoying a bowl of freshly-made popcorn. Take a class to learn about a subject you’ve always been interested in, such as painting, gardening, or mastering a new language. Spend time outdoors hiking or biking. Exercising and spending time in nature helps provide natural endorphins to boost your mood. Get involved with a volunteer organization that lets you meet new people while helping to make the world a better place. Look for opportunities to socialize at your place of worship, such as guided Bible study groups or short service trips. Making significant changes to your life isn’t easy, so it’s normal to become frustrated when your recovery doesn’t progress as well as you’d hoped. However, you can’t let this frustration cause you to give up or decide that being sober isn’t worth the effort. When you’re frustrated, head to a meeting. Friends and family may mean well, but other recovering substance users will have a unique understanding of the challenges you’re facing. They can reassure you that what you’re feeling is normal and help you work towards finding a way to move forward with your life. In a perfect world, the people closest to you would respect your decision to get clean. Unfortunately, the friends you made while you were still using may feel threatened by your newfound sobriety. They may ignore your requests to engage in drug- and alcohol-free activities, take you to places that trigger memories of past substance abuse, or encourage glamorizing your history of addiction. The sad truth is that there isn’t thing you can do to control the behavior of others. You are only in control of your own thoughts and actions. If you find yourself surrounded by people who aren’t being supportive of your recovery, it’s time to put some distance between yourself and them. Saying goodbye to old friends is hard, but it’s sometimes necessary to move forward. Give yourself permission to seek a new social circle that understands your worth and encourages your recovery. Many people with substance abuse disorders also struggle with co-occurring conditions such as anxiety, depression, and PTSD. If you’re not taking the time to address these issues, you may find that you’re tempted to start using as a way to self-medicate. To effectively maintain your sobriety, you must address all mental health concerns with your therapist or counselor. Cognitive behavioral therapy and/or medication may be necessary as part of your addiction treatment plan. If you do succumb to the urge to use, it’s not the end of the world. One mistake doesn’t mean that your efforts in recovery are doomed. Think of the recovery process as a journey that requires regularly reevaluating which treatment strategies and coping mechanisms work best for your needs. St. Joseph Institute offers extensive relapse prevention and aftercare services, including counseling, retreat programs, and alumni gatherings. If you’re struggling to maintain your sobriety, we can help connect you with the resources you need to ensure a lasting recovery.